We can’t go very far in this conversation though without discussing Dole Whips! 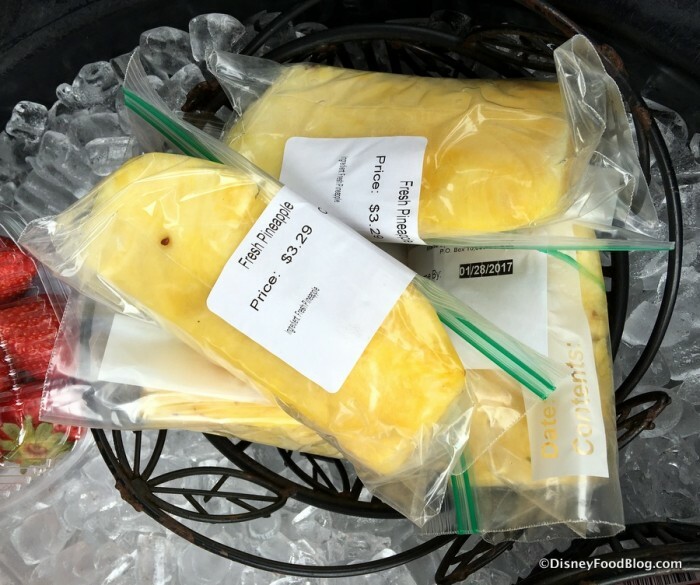 Sure, you can get them at several Disney places on Property — including Pineapple Lanai at the Polynesian. But if you’ve come that close to Cinderella Castle, why not just come all the way? Smooth, sweet, and refreshing, this is one of the only food items I buy on EVERY visit. The Classic Dole Whip Float! Of course, you can’t forget the element of fantasy; and Be Our Guest Restaurant in New Fantasyland has fairy tale qualities in spades. Walk into Beast’s Castle for a sumptuous, French cuisine-inspired breakfast, lunch, or dinner here, and you’ll swear you’ve stepped into animation yourself! Braised Pork — Coq au Vin Style at Be Our Guest Restaurant — for LUNCH! Of course, you can’t forget the table-service options here! Delve into Disney history with a visit to Cinderella’s Royal Table in the castle itself; or party with Pooh and his friends at Crystal Palace! And you all know I can’t pass by Liberty Tree Tavern without heading in for some Ooey Gooey Toffee cake! So many choices; so little time… . 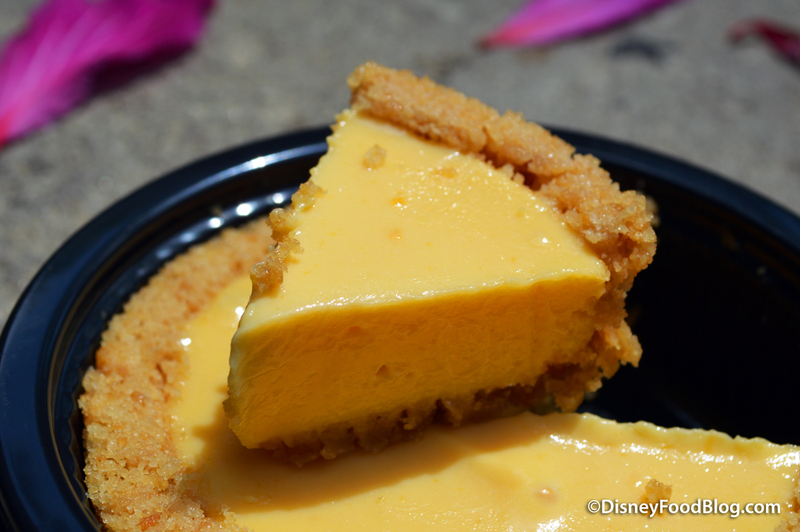 But the prize for Disney food paradise could easily go to Epcot, yes? The sheer variety of offerings, throughout World Showcase especially, makes this a tough contender to beat. Just think about having breakfast in the heart of Paris at Boulangerie Patisserie Les Halles. 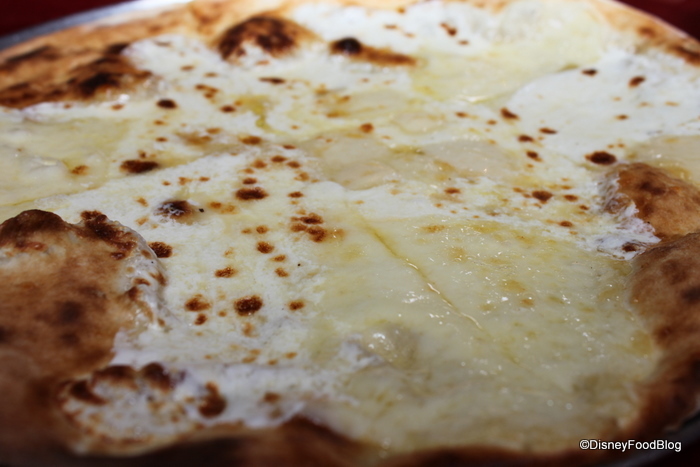 Then stroll around a bit, cash in a FastPass for Soarin’, and head back for some of the World’s best pizza at Via Napoli. 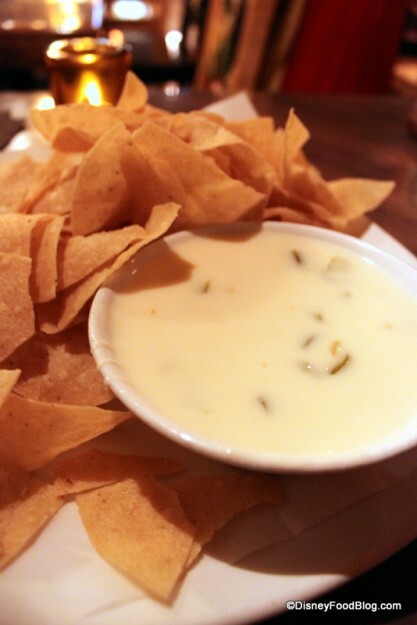 Stop into La Cava del Tequila for a handcrafted margarita and some chips and queso before enjoying dinner with a view of Illuminations at the Rose and Crown! And don’t even get me started on the awesomeness that is Sunshine Seasons at the Land pavilion. As if this weren’t enough, you have the Epcot International Food and Wine Festival each Fall. This mammoth event draws Disney and food fans from all over for eight weeks of culinary and beverage demos, special events, and amazing Marketplace Booths. 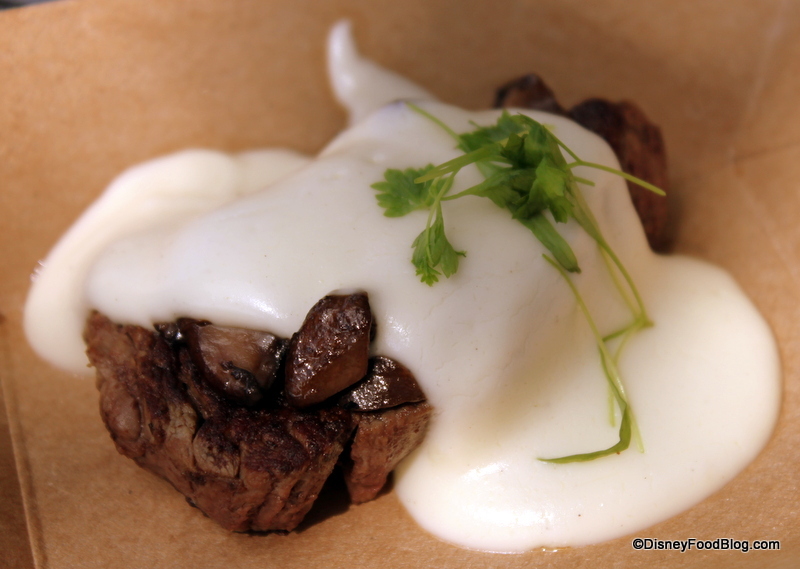 VERY tough to beat Epcot when it comes to food… . It may be tempting to overlook Hollywood Studios as a serious player in this race. 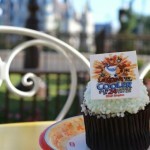 But then, you remember the fantastic themed restaurants… and, of course, the cupcakes. More than any other park, the Studios is the playground to run to when you’re in need of a big ole’ dose of sugar, cake-style. 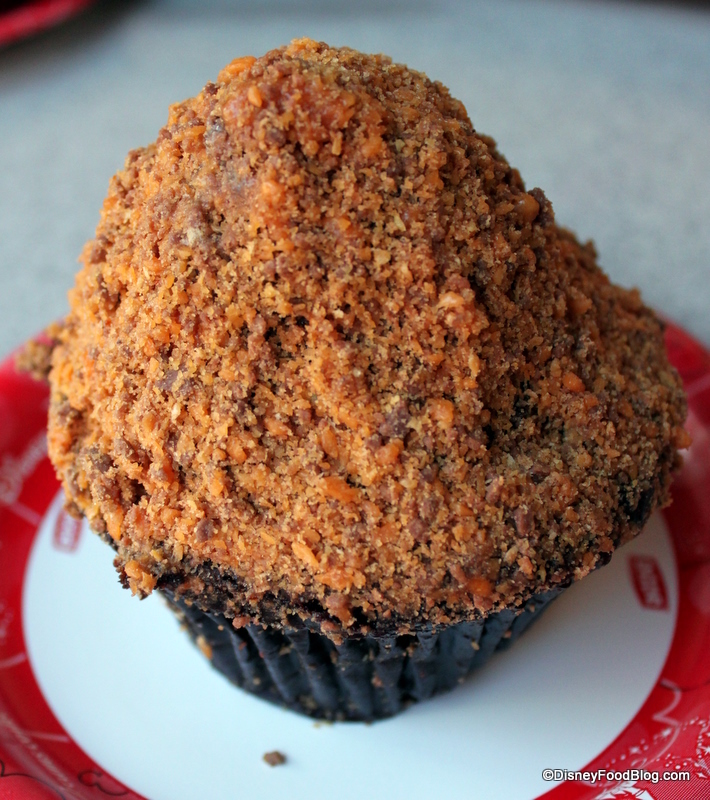 Trolley Car Cafe has inherited former go-to bakery Starring Roll’s cupcake legends, like the Chocolate Peanut Butter Crunch Cupcake (aka the Butterfinger Cupcake (be still my beating heart) and the Chocolate Peanut Butter Cupcake. Add to these the Carrot Cake Cookie at Sweet Spells, and Hollywood Studios cements the vote for some of the best sweet snacks anywhere. 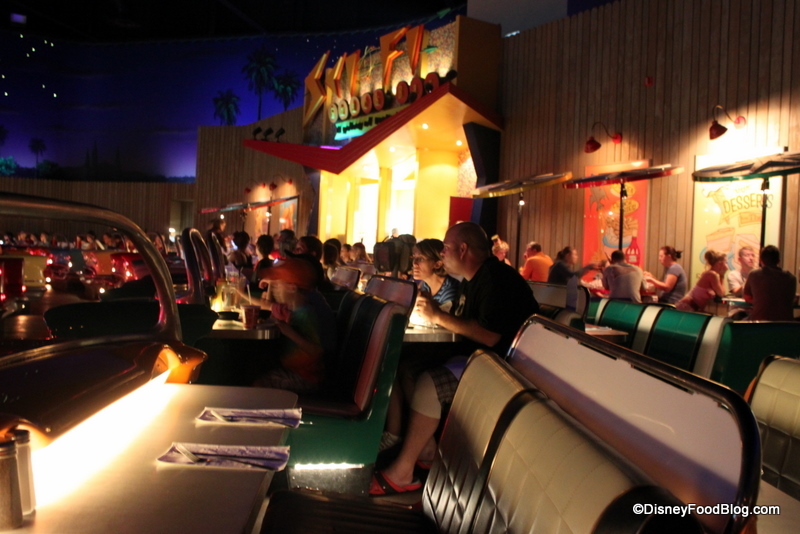 But don’t forget some of the best super-themed restaurants around — Sci-Fi Dine-In and 50s Prime Time Cafe! Head to Sci-Fi Dine-In for classic and so-bad-they’re-funny B movies playing on a loop on the drive-in screen. Dine under the “stars” in a convertible or at picnic tables in the back. Looking to try a classic with a twist? 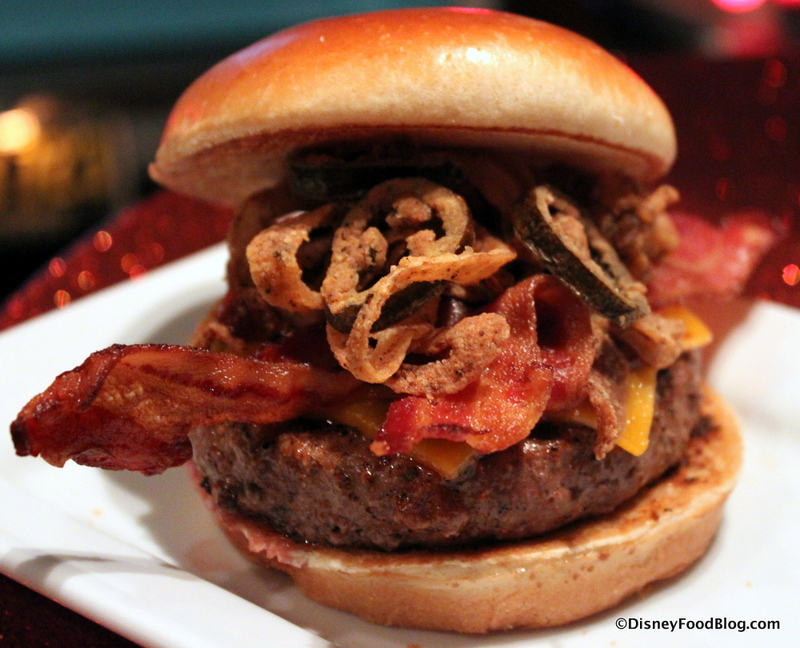 Order the BBQ Burger, which features a fried jalapenos and loads of crispy bacon! But if you’d like to feel like an extra in a mid-century sitcom, then 50s Prime Time Cafe is the place you want to be! You’ll swear you’ve stumbled into your Aunt Mabel’s kitchen here. Go ahead — I dare you to look around and NOT find something that you remember from your grandmother’s house on the shelves! And with well-prepared comfort foods like Aunt Liz’s Golden Fried Chicken, the smells and tastes of childhood are there, too. But we can’t forget about Animal Kingdom! This exotic park has managed to carve out a special niche all its own. It seems to be a study in extremes. 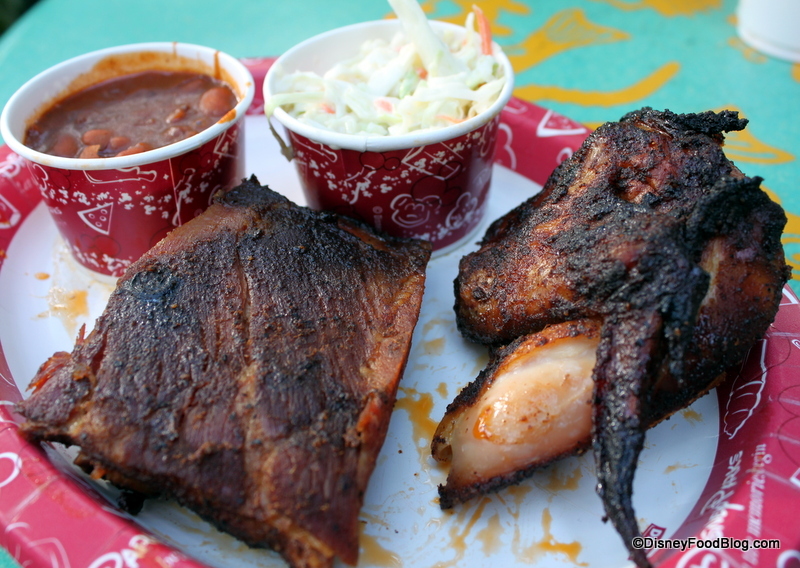 The two things that I think of when I think food at Animal Kingdom are vegetarian… and barbecue. In recent years, stands like Caravan Road (formerly the Bradley Falls Kiosk) have begun offering delicious, beautiful, and filling vegetarian options. The Asian Noodle Salad and Edamame easily make for a complete meal! 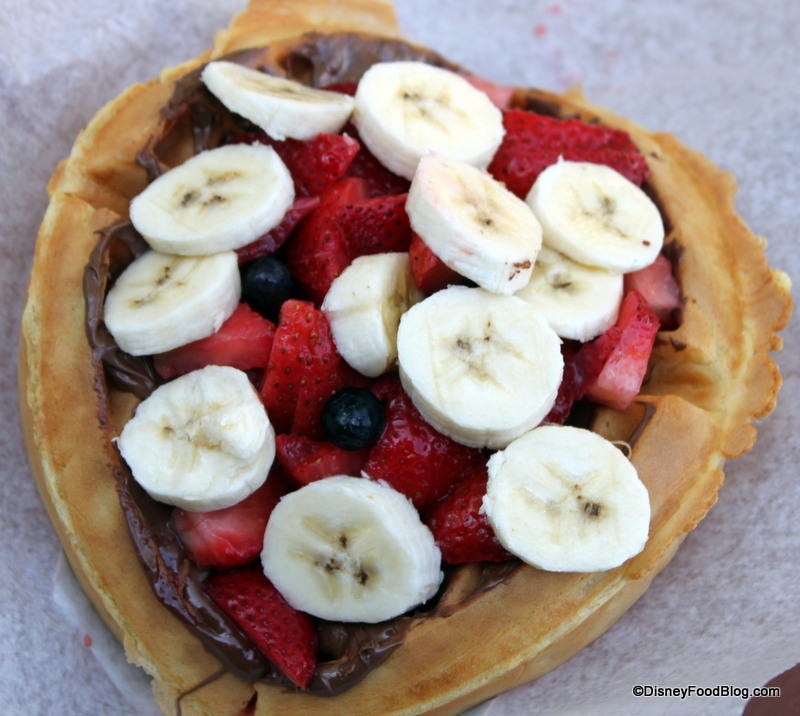 Harambe Fruit Market also features great, healthy options, including fruit, freshly prepared and ready to eat. It’s a great alternative to heavier options. 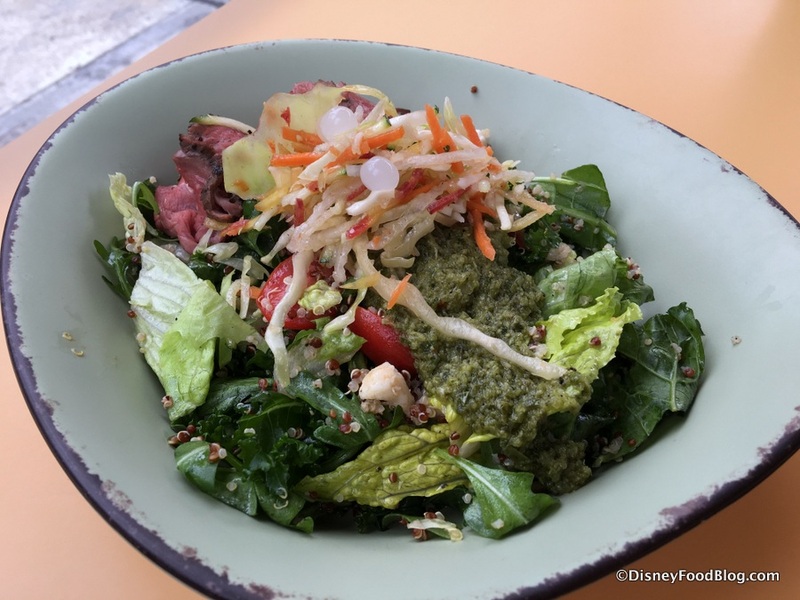 For terrific healthy options that allow for custom eats, drop into Pandora’s Satu’li Canteen, where you can select all of your favorites to be combined into one delicious bowl of energizing grub. 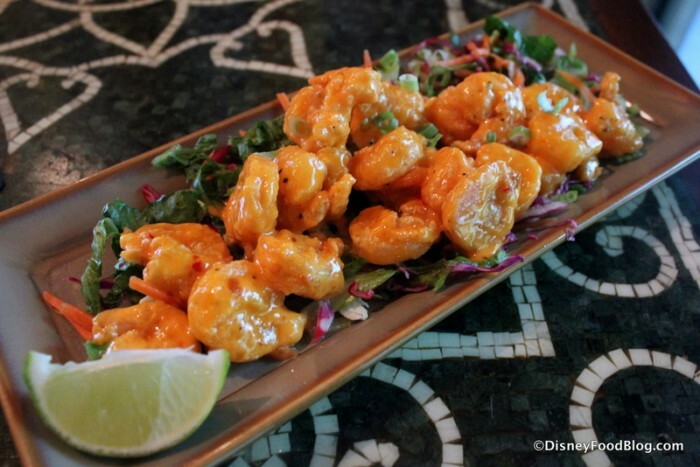 For something light with a kick, you have to try the Firecracker Shrimp at Yak and Yeti Restaurant! These lightly fried shrimp are tossed in a spicy-sweet sauce that is out of this world! But if walking the Animal Kingdom trails has you craving heavier food, where do you go when you want terrific barbecue at Walt Disney World? Why, Flame Tree Barbecue, of course! 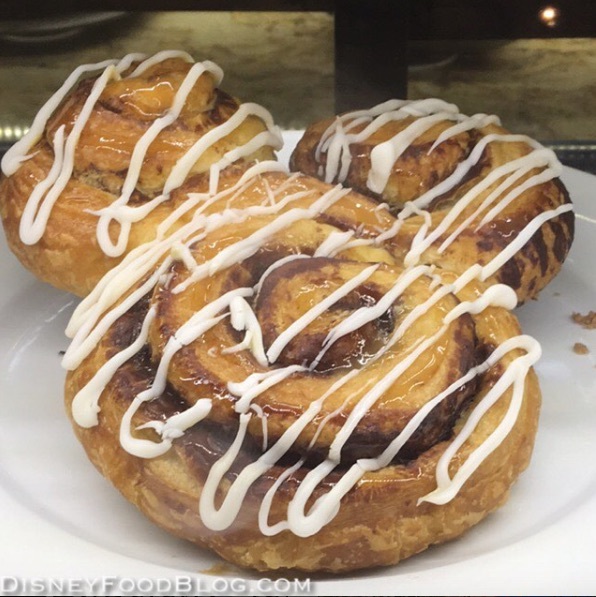 Another must-do at Animal Kingdom is a stop by Kusafiri Coffee Shop and Bakery for something sweet. Like a truly Colossal Cinnamon Roll! But if enormous cinnamon rolls aren’t your jam (are you sure? ), the Mini Mango Pie at Yak and Yeti Local Foods Cafe is stupid good! It will win every dessert battle — hands down! 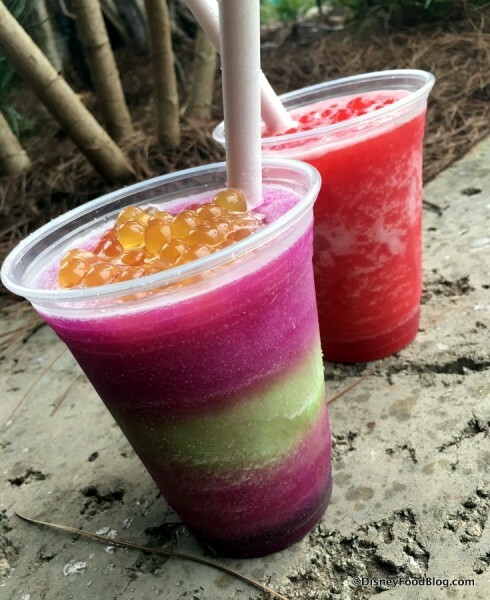 And when you’re thirsty, don’t forget to swing by Mahindi (formerly Harambe Popcorn) for a cup of Jungle Juice Slushy! Or visit Pongu Pongu Lounge for tons of refreshing drink options! Now, we know Disney Springs isn’t technically a Walt Disney World park, but when you’re playing the “where can I find the best food in the World” game, you gotta let Disney Springs play! Because Homecomin’s line-up of Southern favorites is a surefire hit (and one that we keep visiting over and over…). 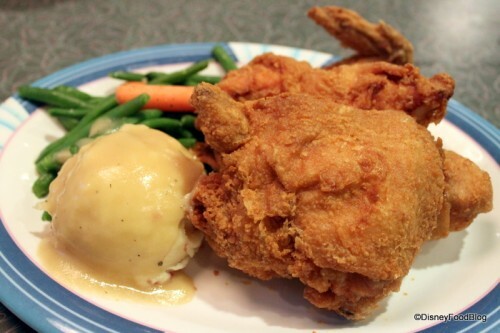 Chef Art Smith’s world famous Fried Chicken can’t be beat for crispy fried comfort food! 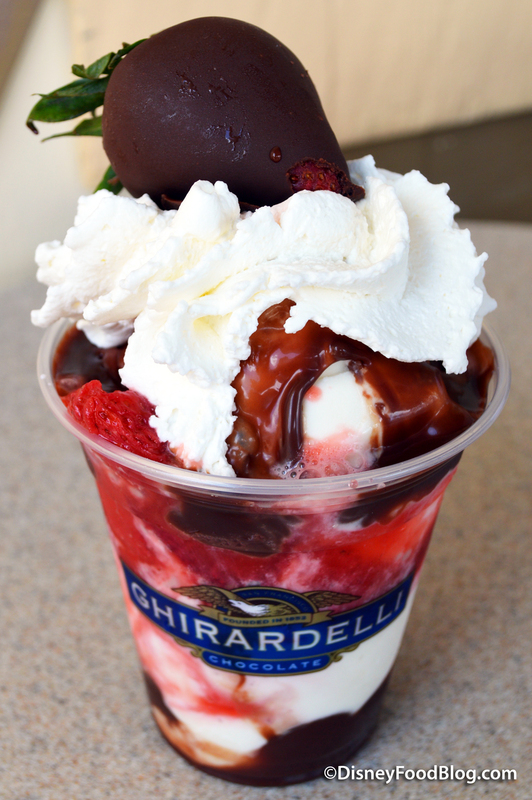 If you’re more in the mood for something sweet, you have to head over the Ghirardelli’s Ice Cream and Chocolate Shop! You’ll find classic flavor combinations — like strawberries and chocolate — in sundaes with San Fran-friendly names like Presidio Passion. 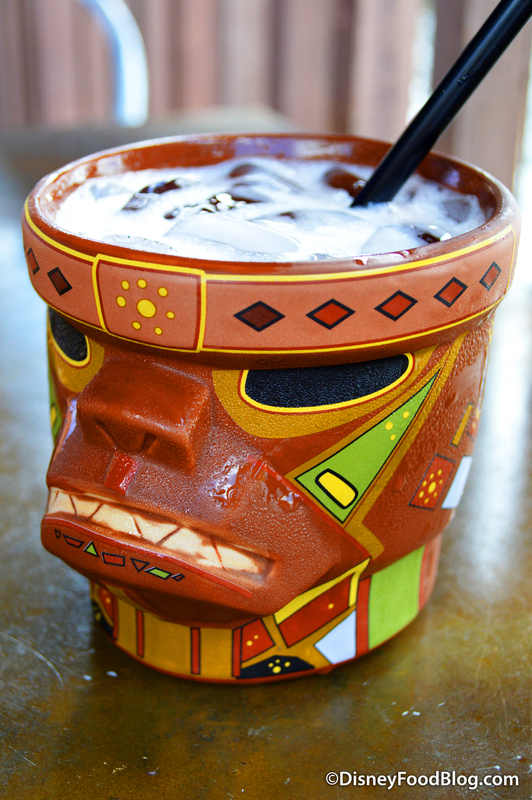 There’s no shortage of drinking holes in Disney Springs, but for sheer fun and immersion, Jock Lindsey’s Hangar Bar wins hands-down! Fans of the Indian Jones franchise will dig fun grown up beverages like Reggie’s Revenge and the Cool-Headed Monkey! 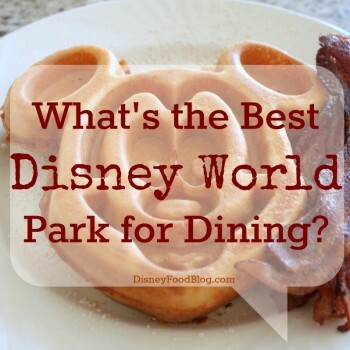 What is your favorite park for dining in Walt Disney World? Which of the four parks — or even Downtown Disney! — gets your special attention when it comes time to plan meals and advance dining reservations? Where would you rather eat than ride? Join in on the conversation by leaving a comment below telling us all about your favorite! Thanks for all the great ideas! Will definitely be trying these out the next time I’m there. 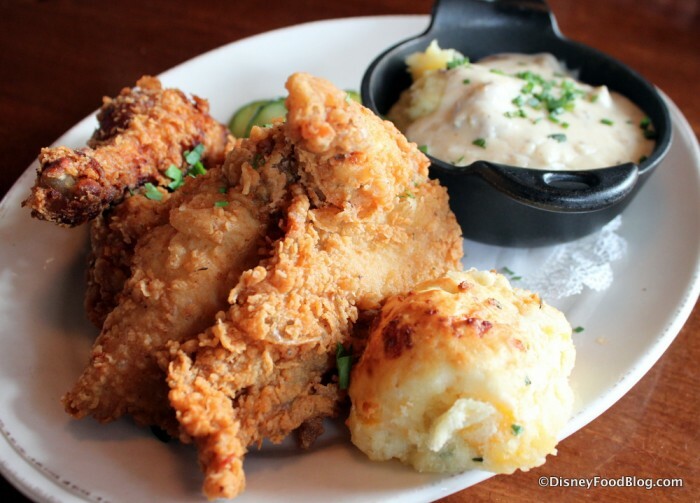 One of my all time favorites is Liberty Tree Tavern in the Magic kingdom where it is Thanksgiving dinner every day. While it is a prefixed menu, (just like mom’s at Thanksgiving) because of it the service is fast. Plus if something is your favorite, you can ask for more. It also is one of the best kept secrets still and while other in the park are full, Liberty Tree Tavern is the last to book and getting in on a cancelation is a real possibility. Counter service wise, I’m going to have the give the edge to Magic Kingdom only because it seems like I always fail to make all my favorites during each week-long vacation, especially with the addition of Be Our Guest lunch (try the pork!). Fav MK food: don’t knock me for saying I love the fish and chicken finger combo at Columbia Harbour House! 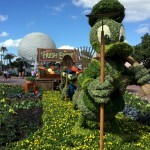 Epcot gets second, although first in food quality. It would have been first had I been happier with the revamps of the Cantina and Patisserie :(. I love grab n go from Seasons market (cous cous, hummus, pita) and the orange chicken from Lotus Blossom. Studios is my favorite park, with the worst food options. C’mon, Disney, we need some excitement here! Still, Starring Rolls is a gem, and if the bun is fresh, the BBQ pork and coleslaw hot dog can really hit the spot. Although I was pleasantly surprised by the new offerings at Tamu Tamu, for the best of Animal Kingdom, the real winner is at Animal Kingdom Lodge. If you haven’t tried the African stew and chicken flatbread, you are truly missing out on something amazing. Love Mara soooo much! P.S. I always stay at Caribbean Beach Resort, and their turkey BLT is outstanding! I guess I have target spots that I HAVE to hit on each visit, so I don’t think I could ever choose just one park. Even when I’ve only done 3 or 4 day vacations, I always manage to hit each park and Downtown Disney at least once! Wolfgang Puck Express and Ghirardelli Chocolate Shop are must stop spots! This is the most one-side question of all times. Epcot was built around dining. It is one of the park’s primary selling points. Epcot could take on all of the other parks combined. definitely Epcot, Epcot has every kind of food you could ask for. When our family goes it seems we all have different favs in each park. In MK our quick service is Paco Bill and our oldest daughter loves her dinner at Liberty Tree Tavern. In EPCOT it’s not a visit until I hit Yorkshire County Fish Shop while my wife wants her meal at Tutto Italia. Over at Hollywood Studios Staring Rolls gets our vote for sweets, Pizza Planet of quick service and it’s over to Hollywood and Vine for dinner. And finally. At AK it’s at Tusker House for the best breakfast on the property (In our eyes). heading down for the Food and Wine Fest for the first time hoping to find some new favs. I have to give the edge to Epcot when it comes to park dining. There’s good eats in every park, but the variety and quality of the food at Epcot is the best IMO. Especially during the Food and Wine Festival. If I didn’t love the other parks so much I could go to Epcot every day during F&W just to sample the festival booths’ offerings. Maybe I’m biased because my annual trip falls during the Food & Wine festival, but even without the fantastic kiosks my vote has to go to EPCOT. They offer excellence in both table and counter service, as well as the best variety of any of the parks. I think EPCOT has most of my favorites. Chefs De France- French Onion soup!! AK Saana, High tea at Garden View Lounge, GF Cafe- Grand Sandwitch, OKW Olivia’s Best Breakfast potatoes ever. I’m going to have to say Epcot is my favorite park to dine in. Every restaurant I’ve been to in Epcot has been superb. La Hacienda de San Angel was one of my favorite places to eat and it had a great view of illuminations. The park I wasn’t really impressed with food wise was Hollywood Studios. All we could find for lunch were mediocre sandwhiches, nothing special. Anyways, Epcot is by far my favorite park to dine at. Epcot dominates this. So many great places and so many great choices. Epcot is food. After that it gets kind of even. Although the SciFi and 50s prime time are very unique at the Studios add that to the Brown Derby and you got some great options. MK and AK have some good offerings as well. EPCOT! There are so many great sit downs like Via Napoli, LeCellier, Tutto Italia. We love Tutto Gusto as well. I feel the CS options are the best as well. Of course, it would be EPCOT. To dine anywhere in the world, in 1 park, is a beautiful thing. BUT, my favorite all around park is Hollywood Studios. I’d have to give a slight edge to EPCOT just based on places I haven’t like which in all the places I’ve been at EPCOT 2 haven’t been obsessively loved and that’s not even including the Food and Wine festival. I do like things from other parks (like the dole whip float and the BBQ at Flame Tree) and there’s also things other places that while I have never had them they never fail to make me drool (waffle sandwiches) I have to say that EPCOT is pretty consistently a winner. MK for QS and EPCOT for TS. Interesting that you (and other commentators) left out Hollywood Studios’ Hollywood Brown Derby. Although I think that Epcot is head and shoulders above all of the other theme parks in terms of quality and selection, the Brown Derby is a fantastic restaurant. Sure, the Cobb salad put it on the map, but there are som many great appetizers and entrees there that it squarely fits into the top 5 of my favorite Disney them park restaurants (together with Bistro de Paris/Monsieur Paul, San Angel Inn, Le Cellier and Via Napoli. My fiancé and I are spending part of our January honeymoon at Disney World and I think we are going to spend the whole time eating! I have a list of things I absolutely HAVE to eat. In the Magic Kingdom I have to have a Mickey pretzel with cheese, an ice cream cookie sandwich, and a Mickey ice cream bar because it’s just more magical eating it by the castle! I usually have to do Pizza Planet at Hollywood Studios, and this time I want to try a carrot cake cookie because they sound fantastic. Flame Tree BBQ is an Animal Kingdom must, but I don’t really have go-to in Epcot. 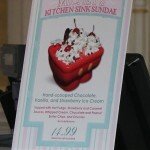 Of course Downtown Disney is all about the cookie bottom sundae at Ghirardelli! No brainer……this is not even close!!! I can understand how some can give the Quick Service medal to MK….especially traveling with kids. But you can do Epcot for a month and never have the same meal!! Epcot is the only park my family eats dinner in… Its either Downtown Disney, a resort, or Epcot. I eat least in Animal Kingdom because the very new vegetarian options still don’t look too wonderful. We don’t even eat lunch there. Epcot, even with out Food and Wine (and a world with the F&WF would be a sad sad thing) I think it has the most choices with the most variety. With exceptional sit down places, counter service and snack options it really has the most across the board appeal. 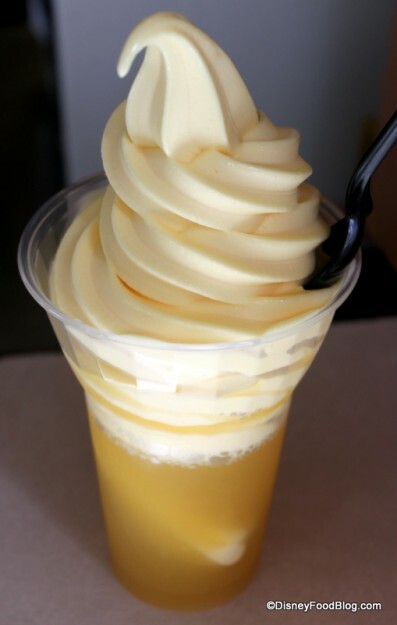 MK would be next in my book and not just for Dole Whip (Though really I am pretty sure I could eat nothing but Dole Whip. Mickey Bars and School Bread for a whole vacation and be completely happy, tummy ache and all!) They have fun restaurant choices, decent counter services with a little variety and a ton of yummy and tempting snacks. AK would have to be third, not because they are so great but because DHS is that bad! AK does have some fun snacks and I love Flame Tree. However I always feel like I am floundering to find somewhere to eat here. We didn’t like Yak and Yeti, I can get Rainforest at home. Tusker house is good but a little crazy (or a little creepy and dead if you have a 5pm dinner) I love the Elephant cupcake and the fresh fruit options here for snacks. DHS is last and definitely least as far as food goes. There are okay sit down places but the counter service is dismal at best. I never go here over a meal time with out an ADR. There are some yummy snacks options. Overall I don’t think many people would argue against Epcot being, overall, the best place for food based simply on the sheer variety available. It’s lacking in one key area: Breakfast. The selections are very limited. 2 quick service, one sit down. For a park of it’s size this is a sorry state of affairs. I would say, for me, Epcot wins for both counter and table dining within park just because of the large number and variety of options. Also, Epcot is definitely the most fun park for me to grab some yummy food and do a little people watching and shopping. If you make your ADRs ahead of time, your one day at Hollywood Studios can be pretty great in the eats department. 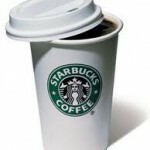 – grab a little something on the way in at Starring Rolls. Multiple days at DHS would reveal the thin selection there, but if (like most visitors) you’re only going to spend one day in this park, the above line-up competes well with anything you could come up with for one day at any of the other parks. Here are my faves (that I can remember off the top of my head). these are the dishes that are on my “must have” list everytime I go: Lobster omlette at Olivia’s Cafe (OKW), The Crab Cake Eggs Benedict that used to be at Captain’s Grille (Yacht Club) but is now at Boatwright’s (Port Orleans). The Grapefruit Cake at Hollywood Brown Derby. The wings at ESPN Club (Boardwalk). The Fish N Chips at Raglan Road (DTD). Anything at Fulton’s Crab House (DTD) after the sun has set and the lights of DTD are reflecting on the water. The warm bread w/roasted garlic (and anything else) at Portabello (DTD). I love the Biergarten in Epcot – sooo much fun! 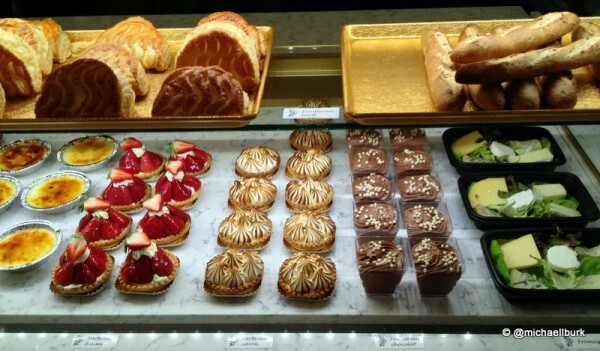 I can’t resist Boulangerie Patisserie in Epcot. Bread Pudding at House of Blues (DTD). But I can’t do Disney right if I don’t have breakfast with Mickey and the gang at Chef Mickey’s (Contemporary). This is so much fun at any age because, let’s face it, we’re all ablut 6 years old once we pass through the gates. There’s my list. Hasn’t Disney did a wonderful job of giving us variety for dining? Yes, food is expensive at Disney, but they have clearly worked hard recently to improve the quality of our dining experiences. While Epcot is my clear favorite for food, like everyone else, I have some necessary stops in each park for every trip. Sometimes it is very hard to choose between an old favorite and trying something new! Kristen mentioned it briefly, but in talking about dining in the parks, we did not even touch on the many places to eat at the resorts. 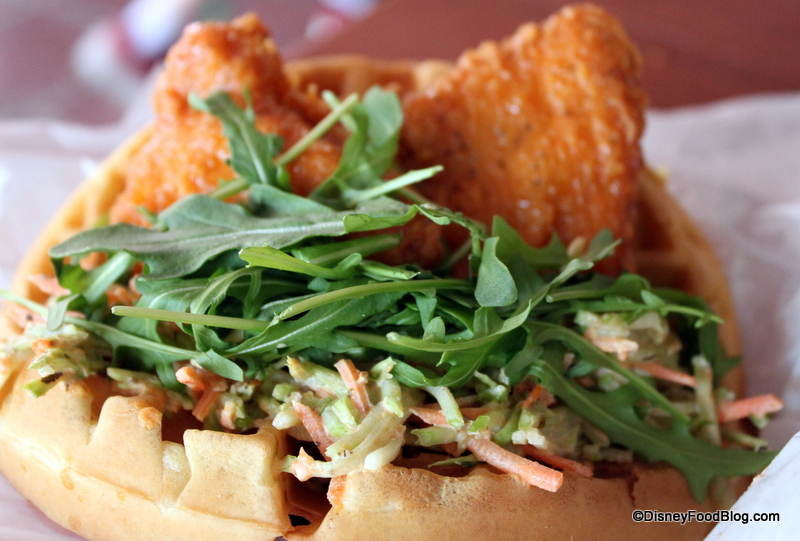 There are so many ways and places to enjoy Disney dining. I can’t wait for October! Without a doubt, if I’m planning to take the time and enjoy a delicious meal that requires setting a reservation, it’s definitely the Magic Kingdom. I’ve got two favorite places there, the Liberty Tree Tavern for lunch (definitely that meal time!) and the Crystal Palace, which is a wonderful buffet with meats cooked perfectly, simply prepared veggies and desserts galore. 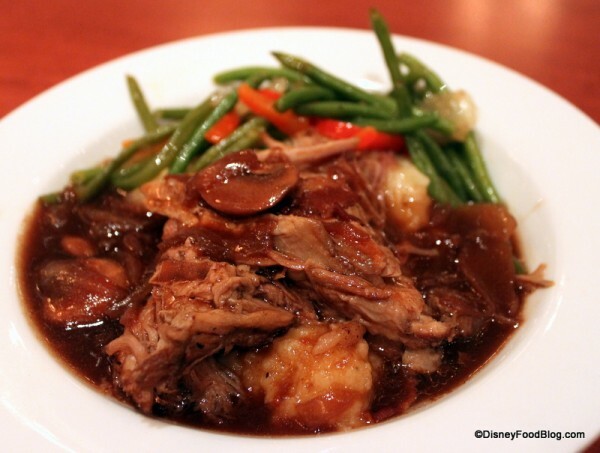 When I go to the Liberty Tree Tavern for lunch, there’s one thing I want: the pot roast. I’ve been hooked on that meal since I first stayed on Disney property in 1992. 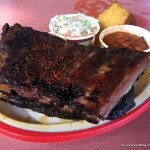 When it’s a quick meal, have another two favorites: FlameTree Barbecue at Animal Kingdom and Sunshine Seasons at EPCOT. 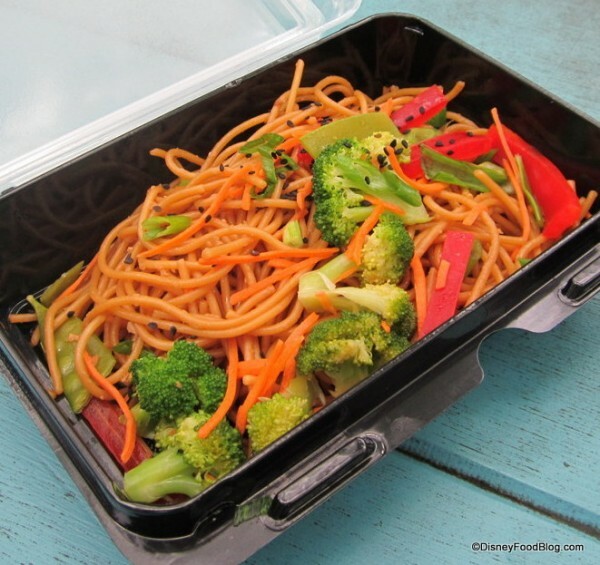 Both are some of the most economical meals at WDW and quite filling. Just celebrated my 51st birthday at Animal Kingdom and had my birthday meal at FlameTree. The place and food is still a wonderful way to celebrate. Thank you Gary! While I am not generally impressed by the food at HS, I had one of my best WDW meals ever last December in the Brown Derby. The food was top notch, wine list interesting, and the atmosphere exuded adult, Old Hollywood glamour. While you highlighted many of the amazing quicker and sweeter fare around the parks, as an adult traveling solo, another several articles might focus on the utterly spectacular cuisine that might break the bank for a family with kids who might not enjoy all that is available…… this is without heading out into the hotels–gems in their own right. Sorry, props for the fun and informative article! Like the parks, it’s impossible to do it all in a limited amount of time. I’ve been a Passholder for years and there’s always something new, delicious and exciting as I journey down from Ohio! Keep up the great work…. I have to vote with Epcot, for massive variety of flavors and tastes. Im a little sad that a mention of Studios doesn’t have the Derby- no love for a little nostalgic noshing? sometimes lunch there is the only reason we go into the park at non-stormtrooper times! Are the spring rolls still offered in DAK? We were at Bradley Falls a few weeks back and they weren’t offered. I haven’t been able to track them down anywhere else in the park. Hope I’m just not looking in the right place because those were my go-to DAK snack. A.J., help!! 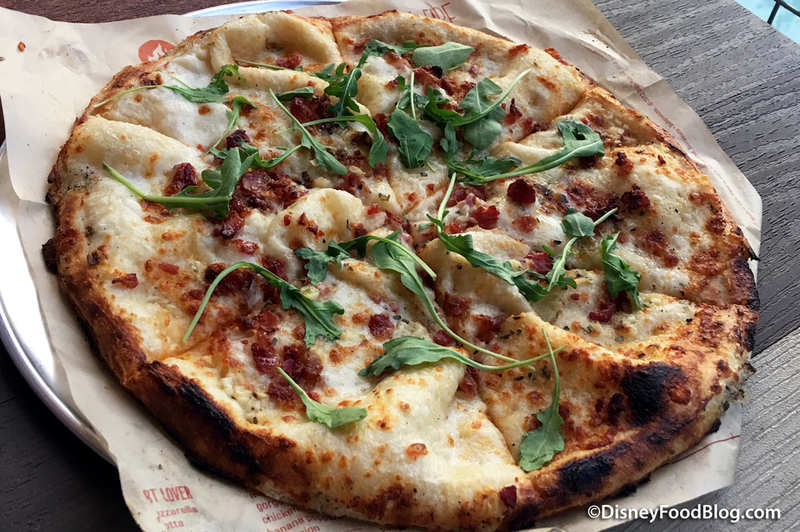 – Discovery Island: Pizzafari (actually has a delicious breakfast sandwich [great for taking advantage of cooler early morning hours, when the animals are all really active]). To be honest, DAK has the most ‘refreshing,’ light options- ones that I often look forward to and seem to fit with the natural environment the park promotes. Hollywood Studios has SO MANY great options at the Brown Derby alone (the least of which, in my opinion, is the filet), Prime Time has killer fried chicken and a PB&J milkshake, Starring Rolls and Writer’s Stop offer up delicious baked goods, and even Backlot Express has some decent sandwiches (like the pressed grilled veggie sammie). They also had bread cones for a bit, although those are gone now. And to further put me out in left field, my least favorite park for dining is Magic Kingdom. Besides BOG, the counter service options are mostly fried or burgers, and forget about grabbing a ‘late night’ counter service meal- Cosmic Rays (yuck!) or Peco’s Bills (not so great) are the only options. Casey’s is the saving grace, but those hot dogs and corn dog nuggets can sit heavy on your tummy as a late dinner. I do like Columbia Harbour House (the tuna sandwich) but that seems to close fairly early. Liberty Square Market has nice snack options, but again, no late hours there. Often MK is the park that’s open the latest, and I find the dining options to be severely lacking. I must have another PB & jelly shake from 50’s prime time diner. You can find the other food at other restaurants but no where have I come close to that shake. For any of our family members, it would be very difficult to single out any one restaurant at WDW. We have been going to WDW since 1974. At least one trip per year and as high as 3. Living in Missouri it always was a treat to make the trip. In the very beginning we tried to visit a new eatery each trip and it would be decided later that it might be awhile before we go back to that one. Many have had repeated visits. It’s all about the FOOD.